Athens | and sure stars shining . . .
Mars Hill, or the meeting place of the Areopagus, as viewed from the portico of the Acropolis. I stood today on this very rock, Mars Hill, where St. Paul preached one of the Book of Acts’ most famous sermons. This big ol’ rock, in this photo with lots of people standing on it, overlooks the ancient agora where Paul taught centuries after Socrates taught as well. And as I stood there, I was overcome with deep, powerful emotion. This entry was posted in Daily Life, Episcopal Church, Life, Travel 2015 and tagged Areopagus, Athens, Mars Hill, St. Paul on September 9, 2015 by Jeffrey Carter. At 9.45 p.m. local time, I’m back at my apartment, packing up. But not before posting dinner photos first. I returned this evening to Bairaktaris. Sure, I could have higher-brow food, and could have had better ambience. But sitting in the open night air, surrounded by throngs of happy locals and tourists, is not a bad thing at all for a last evening in Athens. I ordered a Greek salad, and kabobs with yogurt sauce. The host brought the usual on-the-house dessert, this time with what I thought was a small glass of water. Nope. That was pure ouzo. Undiluted. I almost tossed it back after the dessert, until I got a whiff of it. Then I sipped. 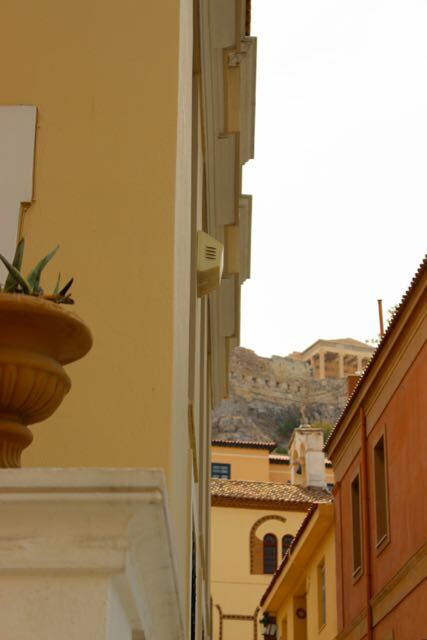 And then there was that one last view of the Acropolis down a side street. 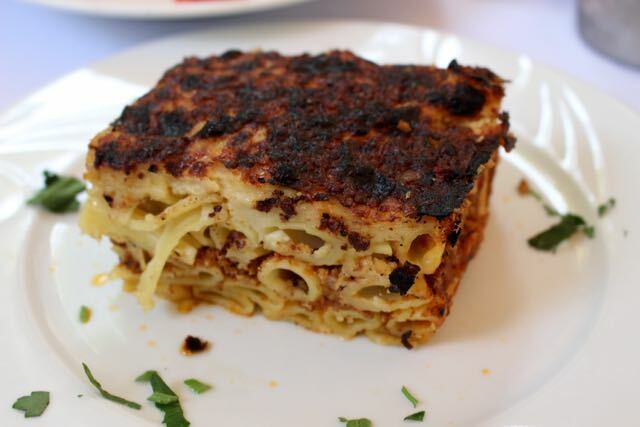 This entry was posted in Food, Travel 2015 and tagged Athens on September 9, 2015 by Jeffrey Carter. Old Roman cistern. Nature always wins. Olive tree by a sidewalk. And then one finds a diving helmet. This entry was posted in Travel 2015 and tagged Athens on September 9, 2015 by Jeffrey Carter. Labor Day in the USA. I labored in Athena. At 9 on Monday evening, my perch is at Ithaki Restaurant, just across the square from my apartment. I’ve dined on chicken souvlaki with (gasp!) chips (as in fries). And a Greek salad. Now let me just say: Greek salads here are so incredibly fresh, and undressed. This is twice today that I’ve slathered olive oil and mild vinegar over sliced cucumbers, tomato, red onion, green pepper, olives, and a wedge of feta. And twice that I’ve been delighted . . . avoiding the olives, of course. I’m even eating fresh tomato and raw green pepper, so wonderful is this combination. And then to use this coarse, dense Greek bread to soak up the leftover oil is, well, heaven on earth. Several folks have asked me on Facebook and by email “What are you doing in Greece?”. The answer is simple and complex: I am visiting our Athens and Vienna campuses this week to continue to build opportunities for current and new students in the Webster network. Our Athens campus, under the previous administration, had a master’s program in music. Can we get that program, or something similar, started again? How can we broaden our work with the Webster Network of International Schools? What are ways of increasing enrollment in music courses from students already attending this campus (once the Ministry of Education grants that all-important license)? What new music courses would be appropriate for undergrads not majoring in music? What can we do here to provide courses and a residency option for music majors? These are the questions that are informing my visit and our conversations this week. The end result should be increased opportunity for current students, and open opportunities for new students. Meanwhile, I ended a day of meetings by standing on top of the Webster Ipitou building and marveling at the Acropolis, just a few blocks and an easy view away. And then I spent time prepping for tomorrow, and dining on wonderful Greek food, and taking a brief nap before any of this occured…..
As I write this, I’m still at this table at this restaurant, enjoying a V&T, and loving the fact that Greeks eat so late in the evening. And I just slurped up another slice of feta-laden cucumber. Yup. 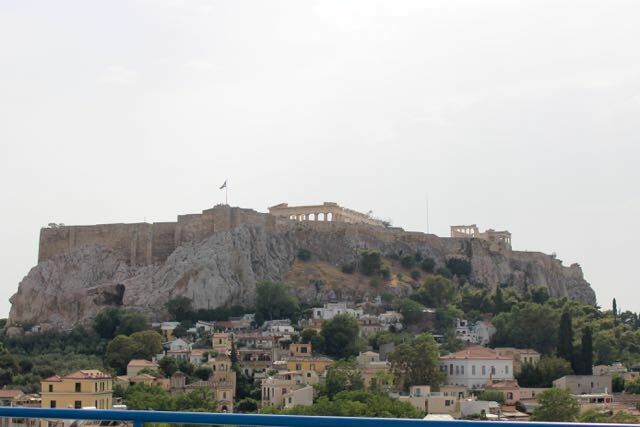 That’s the Acropolis from the top deck of the Webster University Ipitou building in Athens. Looking left from the front gate of the Webster University cultural center. This entry was posted in Travel 2015, Webster and tagged Athens, Greek salad on September 8, 2015 by Jeffrey Carter. 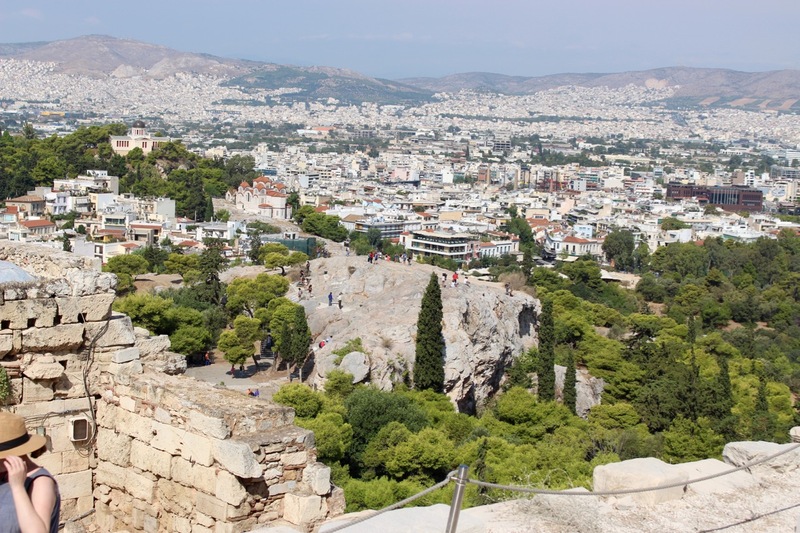 Athens dominates the Attica region and is one of the world’s oldest cities, with its recorded history spanning around 3,400 years, and the earliest human presence around the 11th–7th millennium BC. Classical Athens was a powerful city-state that emerged in conjunction with the seagoing development of the port of Piraeus. A centre for the arts, learning and philosophy, home of Plato‘sAcademy and Aristotle‘s Lyceum, it is widely referred to as the cradle of Western civilization and the birthplace of democracy,largely because of its cultural and political impact on the European continent and in particular the Romans. In modern times, Athens is a large cosmopolitan metropolis and central to economic, financial, industrial, maritime, political and cultural life in Greece. And I am in Athens. I arrived at mid-afternoon after a choppy but pleasant crossing from Hyrda. One of our Webster (University of Indianapolis) alums collected me in his taxi, and dropped me right at the door of the apartment building next to Metropolitan Cathedral of Athens, the seat of the Orthodox Church here in Greece. I was met by Tom, a US ex-pat who manages the facilities for our Athens outpost. After unpacking, a quick rest, a bottle of water, and some email time, I set out by foot. This is the city center after all. And I immediately stepped into the very streets that I had walked here in 2009. After wandering the market streets for a while, I ended up at my destination — Bairaktaris restaurant. 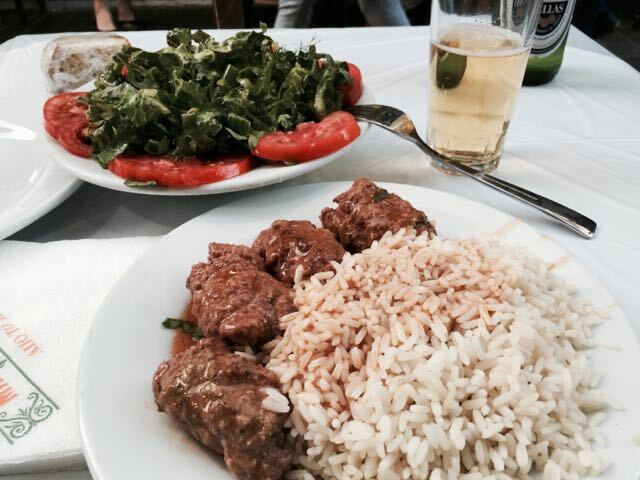 My delicious dinner included a lettuce and green onion salad, four magnificent housemade meatballs with rice, a bottle of Hellas (local beer). And a surprise dessert of fresh peaches in yogurt and honey, with a side of something sticky and sweet and pastry-ish. The manager sent out dessert free of charge! This is one way to earn loyalty. And all for €15. At 8.30 p.m., I’m back at the apartment to stay. Athens was very warm today at over 100°F. I’m ready to call it a day. Oh yes . . . the Acropolis is just three blocks from my apartment. I’ll see the Parthenon later this week. This entry was posted in Travel 2015, Webster and tagged Athens on September 6, 2015 by Jeffrey Carter.